A good access within 5 minutes to center which offers nightlife, restaurants,beach front bars, cafe, shops and convenient stores. A small sized (14 square meters) private rooms with fan OR air conditioned can easily meet with your budget for those who prefer more privacy. 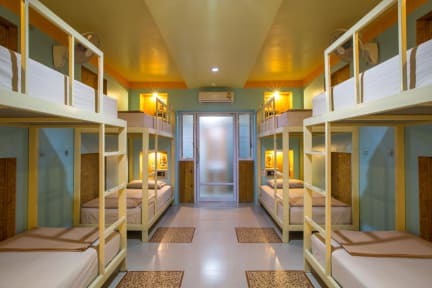 And also there will be one type of 8 beds mixed dormitory with air conditioned for dorm lovers. A social communal area will be provided till 10:00pm and well-trained staffs with good English will host your staying to be enjoyable during your moments on our paradise island. 2. Check in from 11:00 to 22:00.